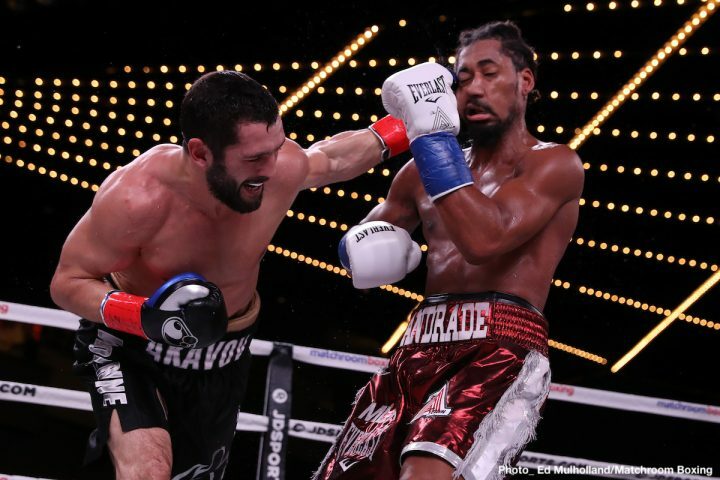 By Chris Williams: Demetrius Andrade (27-0, 17 KOs) called out Gennady Golovkin and Jaime Munguia last Friday night after stopping challenger Artur Akavov (19-3, 8 KOs) in round 12 at Madison Square Garden in New York. Andrade let the boxing media and fans know that he’ll “whoop” both Golovkin (38-1-1, 34 KOs) or Munguia (31-0, 26 KOs) if either of them dares to take him on for his WBO belt. It’s unknown what Andrade thinks about him fighting Callum or Bivol. When Hearn mentioned those guys’ names as potential opponents for him, Andrade didn’t speak up or show the same kind of emotion as he did about wanting to fight GGG ad Munguia. Smith and Bivol are a little too big and too strong for Andrade. Demetrius might be able to beat Callum if he can handle his punching power, but it wouldn’t be easy. The fact that Hearn looked excited when talking about the Smith-Andrade fight last night suggests that he likely sees Smith winning that fight. Hearn has been much less excited when asked if he’d let Callum fight Canelo, which would be a bad match-up for him due to the boxing skills of the Mexican star. Bivol, 28, would be a really hard fight for Andrade because he would have to deal with the power, size and the skills of the Russian fighter. Andrade didn’t get hit much last Friday night against Akavov, but he didn’t react well when he was hit. Bivol would hit Andrade a lot, and it would be hard for him to take his shots long enough to get to the second half of the fight, which is when the Russian fighter tends to fade a little. That would be big wins for Andrade if he could beat GGG and Munguia. He’d be on his way to stardom in beating those guys. Golovkin looks like he’s going to wait on his trilogy fight with Canelo before he takes on another tough opponent. If Golovkin does fight before then, it’ll probably be someone beatable in a tune-up level fight rather than a tough guy like Andrade. Golovkin could fight whoever he wants from the 154, 160 and 168 lb divisions, but it’s hard to imagine him doing so in his next fight. Canelo took a glorified tune-up fight with his match against former WBA World super middleweight champion Rocky Fielding on December 15 last year. Golovkin might use that as an excuse to take his own tuneup fight against someone beatable. There are no soft champions at 168 if Triple G decides to go up in weight the way Canelo did ins search of a world title. For Golovkin to win a title at super middleweight, he would have to beat one of these guys: Caleb Plant or Gilberto Ramirez. Some boxing fans think Plant is an easy mark, but he would be a tough fight for GGG. Plant won’t be back in the ring for a while though, as he suffered a cut in his recent fight against IBF champion Jose Uzcategui. Munguia is only 22-years-old. His promoters at Golden Boy are likely going to keep him at junior middleweight as long as they can for him to pick up seasoning, and hold onto his World Boxing Organization belt for easy paydays. You have to believe that by the time Munguia does move up to 160, he’ll be ready to take on WBA/WBC middleweight champion Saul Canelo Alvarez, IBF champion Daniel Jacobs and Andrade, if he’s still a belt holder by that time. Munguia is someone that is goig to be awfully tough to beat if he keeps improving, and if he gets even stronger than he is right now. “Does he have the brand of Canelo? No. Can he beat Canelo? Yes,” Hearn said about Andrade. “It’s only a matter of time. You look at this side of the street [for fighters Andrade can fight with DAZN]. You look at Jaime Munguia. You potentially look at Gennady Golovkin and Canelo. These are the fights that are open [to Andrade]. Callum Smith at 168. Dmitry Bivol said he’d come down to 168,” Hearn said. Andrade isn’t going to beat Canelo if Golden Boy Promotions doesn’t let him have a crack at fighting him. Andrade’s southpaw stance, height and his slick counter punching style makes him someone that Golden Boy probably will keep away from Canelo at all costs. Golden Boy is letting Canelo fight one of Hearn’s fighter in IBF middleweight champion Daniel Jacobs, but he’s someone that is there to be hit, and who has been beaten before by GGG and Dmitry Pirog. Golden Boy probably won’t let Canelo, 5’8″, get anywhere near Andrade. They’ll have the excuse not to make that fight by pointing out that Andrade is’t popular, he fights with a southpaw stance, and he’s a slick fighter. No one will give Canelo grief for not fighting Andrade unless he becomes popular somehow, which is going to be hard for him to do if he can’t get the big names to fight him. Hearn lucked out with Golden Boy letting Canelo fight Jacobs, but he may not get lucky a second time when it comes to Andrade. “Sulecki is ranked #4 with the WBO. He’s someone we can look at, sure,” Hearn said. “I think he’s got a good style. Sulecki would come all night, and eventually he’d get stopped. Sulecki is a good fighter. The biggest problem Demetrius has had is he’s not been active. He’s now had two fights in the last three months,” Hearn said. Sulecki (27-1, 11 KOs) is a lot harder opponent than what Hearn realizes. Sulecki, 29, almost beat Jacobs last April. Sulecki lost a 12 round, but it was a very close fight. Sulecki landed a lot of shots in that fight. Every time Jacobs would throw something, Sulecki would nail him immediately with hard shots. Jacobs ended up taking a lot of punishment in that fight. The 6’1″ Sulecki has the height and reach to hit Andrade, and that’s something you have to be concerned with. Andrade doesn’t look good when he gets hit. His spins around on his neck, and he almost looks like he’s lost his senses for a split second each time. Sulecki is someone that would connect a lot of shots in a 12 round fight with Andrade. It would be a much tougher fight potentially for Andrade than his recent contest against the much shorter 5’9 1/2″ Akavov last Friday. Sulecki has the height and reach to hit Andrade a lot. Akavov didn’t have the size to do the same. Hearn is going to find someone quick to get Andrade back inside the ring in the next three months or so. He didn’t take punishment against Akavov, so he should be able to return to the ring against someone ranked in the World Boxing Organization’s top 15. It’s not likely that Hearn will put Andrade in with Sulecki, Callum, GGG, Bivol or Munguia. That’s just talk by Hearn. It’ll probably be someone like Martin Murray, Jack Culcay or Mark Heffron.